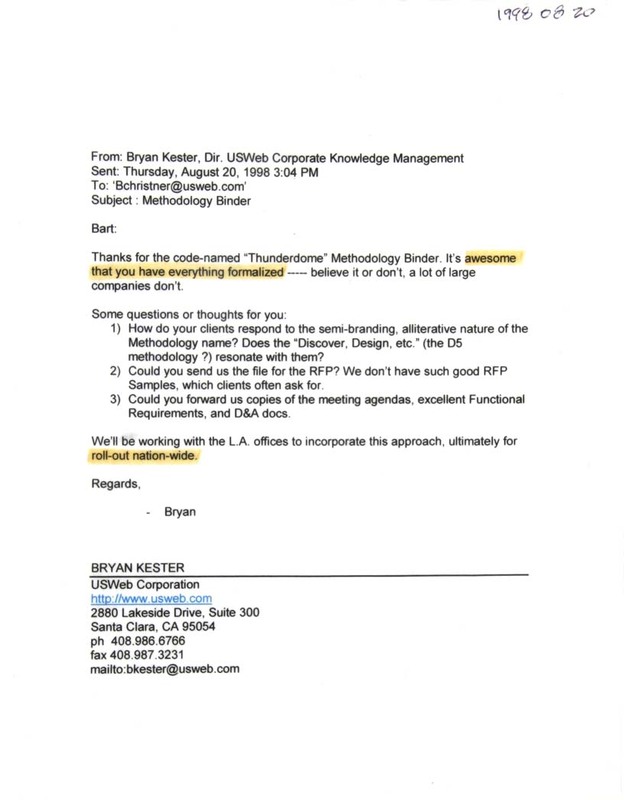 Thanks for the code-named “Thunderdome” Methodology Binder. It’s awesome that you have everything formalized ----- believe it or don’t, a lot of large companies don’t. 1) How do your clients respond to the semi-branding, alliterative nature of the Methodology name? Does the “Discover, Design, etc.” (the D5 methodology ?) resonate with them? 3) Could you forward us copies of the meeting agendas, excellent Functional Requirements, and D&A docs. We’ll be working with the L.A. offices to incorporate this approach, ultimately for roll-out nation-wide.